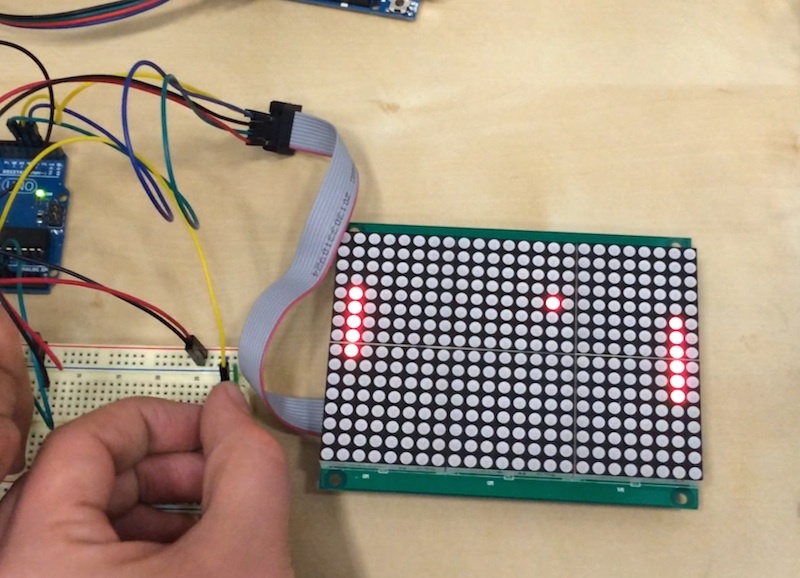 LED Matrix Pong is a simple implementation of the old Atari Pong game, written for Arduino. Two potentiometers control the two paddles, and the “ball” bounces between them. A little bit of structure keeps track of points and shows the winner. The ball and paddles are displayed on a 16x24 Red LED Matrix, like this one from Adafruit. Requires minimal soldering skill; heavy on the programming. Create a new tab: click on the little triangle just under the Serial Monitor button on the right side of the window and select New Tab. Name the tab states.h. Change the physics so that the direction of the ball is different each round. Change the bounce code so that the ball bounces differently if the paddle is moving.